Sometimes I wonder if the people who run F1 know anything about the sport at all. Only today Bernie Ecclestone has commented on the cool fuel appeal in a way that makes it clear he really does not understand what it is about at all. After tempting fate (or the Appeal Court judges) by threatening to resign if the verdict results in the driver's world championship being transferred from Raikkonen to Hamilton (well, I would be tempted - wouldn't you? ), he then suggests that Ron Dennis will drop the appeal at the last moment. Which shows that either Bernie does not understand why McLaren appealed in the first place, or that he does not believe that was the real reason behind it. As revealed yet again in Autosport's interview with Martin Whitmarsh today, McLaren require clarification of the rule since they, like all F1 teams, need to know the boundaries of what they are and are not permitted to do. It is as simple as that and has nothing to do with Hamilton missing out on the championship. The team is doing all of the teams a favor by insisting that the rule be clarified so that there will be no dubious decisions from the stewards in future. Bernie must surely understand this and should know that Ron is extremely unlikely to back down from an appeal required to ensure that his team is not penalized in the future for contravening a rule that is open to whatever interpretation the stewards choose to decide on the day. In even thinking it possible that McLaren would withdraw the appeal, Bernie is effectively saying that he believes Ron to be a liar and that his actual purpose is to win the championship for Hamilton. Can Bernie really believe that Ron would invite the disgust and rejection of all F1 fans that would follow a verdict that altered the championship outcome? The man has been insulted and pilloried all season - is it likely that he would relish the thought of even more to come his way? No, Bernie, it can only be that Ron needs to know how the rule will be applied from now on so that his team can go racing without fear of unfair and idiotic penalties being handed out on the whim of the stewards. It would all be unnecessary had the FIA got the thing right in the first place. I can only presume that, after all these years, Bernie knows absolutely nothing about Ron Dennis. Like Max Mosley, he ascribes to Ron motives and morality akin to his own and gets the man totally wrong as a result. Only a fool would pursue a championship tainted in the way that Hamilton's would be if achieved in such a manner; and Ron may be many things but he is not a fool. It is all a bit pointless anyway since the appeal will not result in the championship changing hands. Bernie gets that right, at least. It was a technical infringement and will be dealt with as such - with a constructor's points deduction or a fine. We all know that. In fact, the only reason Bernie has opened his mouth on the matter is to garner a little more publicity. What a pity he managed to stuff his foot into it so effectively at the same time. Just Bernie trying to influence a decision. It is a shame that neither Bernie nor Max is ever prepared to have an issue decided on its merits and are always seeking to twist it to there own ends. The reason teams spend thousands of pounds shipping fuel chilling equipment round the planet is because you gain performance from it. If four drivers have illegally gained performance thay should be disqualified. I understand that people don't like the idea of a championship changing hands in a court room but the other option is to let the results of the final race of the season stand regardless of any illegalities found later. This gives everyone an open charter to run blatantly illegal cars in the final race of the season. I have never and will never understand how a driver can be disqualified and the following drivers not moved up a place. So long as people have the power to make this kind of decision it will lead to accusations of manipulation. There should be a simple rule that if a driver is disqualified everyone else moves up one place. I have no problem with the drivers' championship being decided in a court any more than I have a problem with the constructors' championship being decided there. If there is illegality deal with it. Don't brush it under the carpet because it will cause bad publicity or because it will negatively affect Ferrari. There have been a lot of statements about Lewis or Fernando not deserving the title but in reality Kimi won in Australia with a blatantly illegal car. So whoever wins it is as a result of interpretation of the rules. I don't believe for a second that they will change the winner of the championship. But just because someone had the most points when the chequered flag fell on the last race should not mean that he is the true champion. At the lowest level of motor sport all results a provisional until post event scrutineering (and any appeals) is completed. If it is right for s club sprint it has to be right for the world championship. Why do I have this fixation on Bernie’s hair style? More important perhaps, who created this masterpiece? His wife? Mad Max? Obviously someone who hates him very much. I agree with all you say, Steven, although I do think that a championship apparently gained in the courts is seen by most people as less than one won on the track. The purists may understand that championships are about an entire season but it is easy to forget that in the excitement of a battle in the final race of the season. Court cases make bad publicity and so rules should be clear and evenly applied if we are not to have seasons like the one just ended. I think the older he gets the more like Andy Warhol he looks. I think the hair is just part of the Warhol look. Now you mention it, are we sure he isn't Andy Warhol...? When I first started to read this article I thought you would be taking the side of Bernie (at least hes against Max on this one). But then I saw the extremely unattractive picture blown up to massive proportions, and realized this was going to a Bernie Bash, and not the one he had for his 76th birthday. I still love the Mad Max picture you had a couple months back. You have a nak for finding embarrassing pictures.... I feel bad for your kids! "(McLaren) is doing all of the teams a favor by insisting that the rule be clarified so that there will be no dubious decisions from the stewards in future." WRONG! 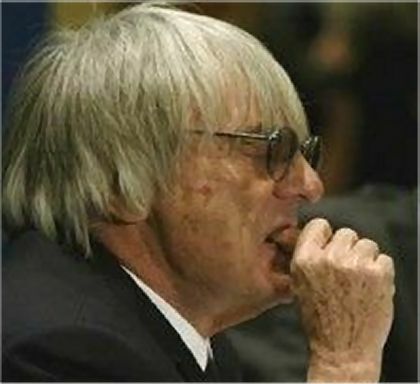 This will not in any way change the way FIA stewards perform, dubious decisons will abound for years to come. "..... the excitement of a battle in the final race of the season." You mean the humiliation of Massa giving up a win in front of his home crowd? You mean the Ferraris just running away from Alonso's McLaren. Am I being a little harsh? In a friendly way, I know what you meant although the words don't apply to THIS years last race. 1. Why hasn't Ron publicly congratulated Kimi yet? That would have ended any negative speculation on Ron almost immediately. 2. Why didn't McLaren just ask for their clarification privately? They could have avoided all this negative publicity for everyone concerned? You can't have it both ways - either Kimi won fair and square or the team broke the rules and neither of their drivers should have won. But the excitement came from seeing whether Hamilton could take back enough places to gain the championship, not from the Ferraris at the front. We all know that they fixed the result but we don't say so out loud ot the FIA might actually have to apply their rules. As for the clarification of the rules business, Naturally the stewards will continue to do as they want but an awareness that their decisions can be successfully challenged will at least slow them down a bit. Since when did any team manager congratulate a competitor on winning the championship? I can't recall Ron ever doing that in the past. McLaren did ask for clarification from the stewards and the answer was so muddled and confusing that they felt it necessary to take it further so that things be made clear for future reference. I'm sure at some point that Ron and Kimi talked. They worked so hard for so long together, even if it meant one of his drivers didn't win the title, I'm sure he was still happy for Kimi ( from a personal standpoint and not a professional). If the title happened to be handed to his driver (unintentionally of course; ) because of this clarification, I think we would see a smirk on his face for the first time since Hungary. I would like to think that at some stage Ron gave Kimi a wink or thumbs up to say congrats but it may not have happened.